Element is part of the Chien J. Wang Collection designed by international designer Chien J. Wang. The ten mirrored crystal bars on the right stands for perfection. The engraving area on the left is slightly angled to give the piece added sophistication. The contemporary design of this tapered crystal bud vase creates an elegant presentation for any recipient. 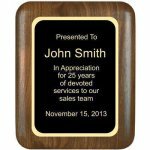 Standing at 1 1/2 feet tall (18") this acrylic award is the top notch award for any occasion. Each posts is 1 1/4" thick and supports a black lasered to gold brass or gold lasered to black plate. This stunning elliptical edge, round corner genuine walnut plaque features a 3" clock with gold bezel and black hands and Roman numeral face. There is plenty of room below the clock to personalize, and the back is key holed for easy hanging. 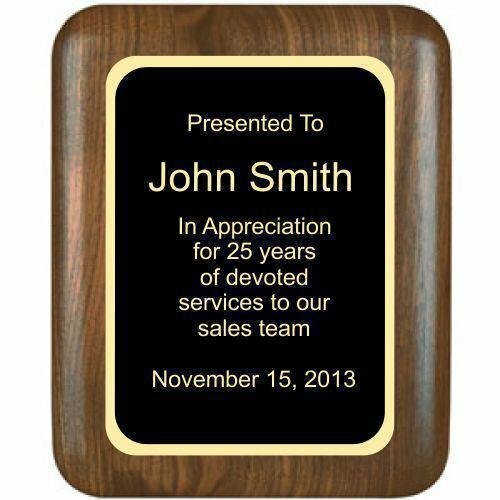 Recognize the accomplishments of your star performers with an award that is both practical and attractive to display. Eclipse Round Corner Solid Walnut Plaques are a premier choice for plaque awards. Available in five sizes.